As sellers of spider traps, we hear feedback from customers who have suffered through the pain and infections caused by brown recluse spider bites, as well as customers who just cringe when a spider wanders through their living room, across the pillow, in front of the bath tub... You get the picture. After selling thousands of spider and insect monitor traps ( the monitor is the window in a basic sticky glue board that can be folded into a tent ) we have seen pictures of spiders on the outside of the trap, dodging the trap and in an infamous spider goes out the windows video we have seen spider crawl into the trap, bypass the glue and climb OUT through the monitor window. It became obvious to Traps Direct's management that some improvements could be made to this IPM (Integrated Pest Management) tool that has spread into the consumer space. The first thing the Integrated Pest Management Design Team did was to chuck the windows. They made sense for an insect monitor in concept, but in practice the monitor windows just made it easy to only have glue on the 'floor' of the trap. The entrances to the trap still remain the biggest windows accomplishing the same thing. There is no chance of an insect going out a window that isn't there! So, the first Advantage Spider Trap feature is solid walls, without windows! No windows means there is no barrier to running the glue up the walls and even onto the ceiling! Advantage Spider Traps have over 250% more sticky glue surface.. Which means more insects caught. Just look at the insect monitor above and the Advantage Spider Trap below to see the difference.. Advantage Spider Traps, no windows.. 82% active trap field. Now with a Spider Trap that is structurally a spider trap, the design team got rid of the IPM matrix. The only information the trap needs to carry is the placement date, which is written on a side wall, (the side that goes against the baseboard). Instead of the resource information and IPM matrix cluttering up the visible surface of the trap, the IPM was dropped, and the resource information is on the bottom of the trap. Out of sight until you pick up the trap to throw it away. This is an advantage of a Custom Designed Spider Trap intended for home use rather than adopting a pest control device never intended for the home. The Advantage Spider Traps are not intended for Pest Control Pros ( however they are using them because of the improved 82% active trap field) so we did not have to have a 'utility' appearance, instead we could focus on a trap that made sense for the home. Instead of screaming marketing messages, the Traps Direct design team selected a dark blue print with very minimal messaging for a more attractive presence. Now that the outside looks attractive, let's add the missing pieces: instructions & resources. The instructions for use are cleverly printed on the wax paper that you peel off to activate the trap... Read them, then they and the wax paper get tossed. Resources like a reorder item #, and a website address make it easy to get more of these simple but effective house spider traps. 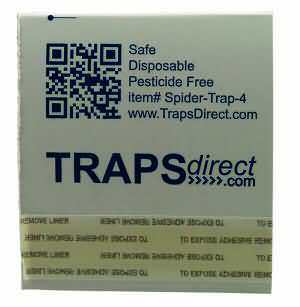 Additionally, for customers who carry a smart phone, there is a QR code / SCAN CODE on the trap that can be used to jump directly to www.www.www.trapsdirect.com/qr-spider to access directions, submit contest photos, or order more traps. QR Code and reorder information. UNDER the trap. This entry was posted in Ask Traps Direct, Spider Trap Reviews, Spider Traps Blog and tagged active trap field, Advantage Spider & Insect Trap, brown recluse spider, IPM Matrix, spider trap anatomy, Spider Trap Resources. 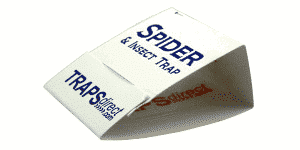 I am using the new spider traps from traps direct to my advantage for placement in customer homes (for businesses and warehouses I am using the generic insect monitors until they are gone). The advantages of the windowless layout really make a difference in what gets caught. The home traps catch roaches, millipedes, spiders (of course) and even smaller insects homeowners didn't know they had. The comparison using Trap Active Catch Field - TACF seems to be popping up in more conversations and I was contacted by a wholesaler who quoted ATFe ratings of the traps he was distributing. As costs continue to rise while every customer I know wants to spend less and get more, I am finding the ability to compare traps very revealing. I like the idea of measuring what I call catch power . Or whatever it seems to go by..
Catching Power is showing up on more comparisons. The discussion between ATFe and TACF centers around how much of an influence the warning margin or absence of the margin has on the capture power (which varys by target insect size). With ATFE (Active Trap Field Entrance) it is only a measurement of the entry to the sticky surface, but the newer TACF (Trap Active Catch Field) adds in half the length of Zero Margin entry areas to emphasize how important the zero margins are. When I look at a metric I always keep an eye on the definitions, and how much the zero margin factors into the rating. I really like the advantage traps, with so much glue area they are as good as 3 of the monitors I used to buy, and they cost less. So consider our vote toward the trap active catch field that includes the zero margins.